In 2008, Masdar Clean Energy embarked on their journey to create the world’s most sustainable city. Masdar City, is integrating smart transportation networks, including cars, light rail and automated pod cars and electric powered public transport options, however the city prioritises walking and cycling. For Masdar City to reach its full potential, it adheres to the guiding principles of sustainability to ensure it delivers social, environmental and economic value. Masdar City is growing around the Masdar Institute of Science and Technology – a research university dedicated to finding solutions in the fields of energy and sustainability. The city consists of all the necessities needed for a major city – businesses, schools, health centres, restaurants and retail precincts. Masdar City is integrating smart transportation networks, including cars, light rail and automated pod cars and electric powered public transport options, however the city prioritises walking and cycling. The development’s pedestrian-friendly design looks to encourage a healthier and more active lifestyle, with amenities easily accessible on foot or via public transport, while communal areas have been intelligently landscaped and designed to provide natural shading and cooler air temperatures. 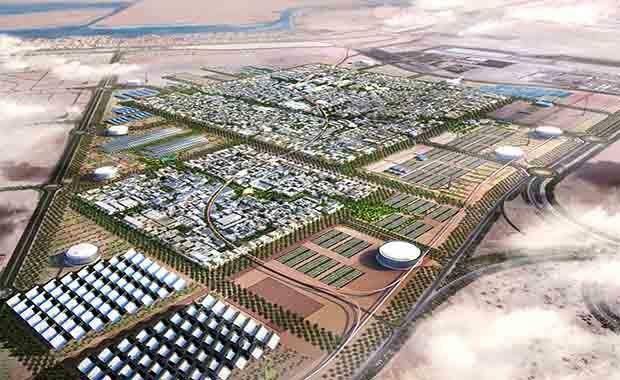 Once the project is completed in 2025, it is estimated 40,000 people will live in Masdar City, with an additional 50,000 commuting every day to work and study. Along with an array of Multinational companies including GE, Siemens, Mitsubishi, SK Energy and International Renewable Energy Agency (IRENA). Masdar Clean Energy vision for Masdar City came from the concern – the world’s energy requirements are expected to double in the next 50 years. 50 percent of the world’s population which lives in cities, is responsible for almost 80 per cent of the world’s energy consumption. The city planners have a visionary concept to pioneer a ‘green-print’ for how cities can accommodate rapid urbanisation, while reducing energy, water and waste. Phase One of the city’s development is offset by a 10MW solar photovoltaic plant, and an array of building mounted solar panels, which minimises the need to power by fossil fuels. The streets have maximum shade throughout the day, capturing cool breezes, and reduces the need for residents and businesses to use air conditioning. The building as equipped with high-efficiency appliances, low-flow showers, a water tariff, smart water meters and treated waste-water that is recycled for plant irrigation ensure water conservation. The city harnesses the sun’s rays, using clean energy generated onsite from rooftop solar and photovoltaic installations. The ground-up approach that Masdar City has taken, ensures a sustainable and enjoyable way of life for residents. Every element of Masdar City’s 700 hectare site has been designed with sustainability and eco-friendly options in mind. Masdar City’s 10MW Solar PV Plant is the largest Solar PV Plant in the Middle East. The plant produces around 17,500 Mega Watts (MW) of clean energy annually, reducing the carbon emission by 15,000 tons per year. The plant consists of 87,780 multicrystalline and thin film modules – 18,228 modules from Suntech and 69,552 modules from First Solar. The plant covers an area of 210,000 square metres. Masdar Clean Energy is involved with pioneering sustainable projects throughout United Arab Emirates and around the world. They have produced other projects throughout UAE including Shams 1, a 100MW concentrated solar power project, in partnership with Abengoa Solar and Total. Masdar Clean Energy has a project in development including 100MW photovoltaic plant in Al Ain, and 30MW wind farm on Sir Bani Yas Island. They have many renewable projects in development throughout the world, in response to the United Nation’s Sustainable Energy for All initiative. Their international profile include joint ventures in developing some of the world’s highest-profile utility-scale renewable energy projects.